The beginning…. In mid-1983 three local bankers, Tom Frost III- Frost National Bank, Eugene Clark- NBC Bank, and Nick Clift- MBank Alamo, met one evening and came up with the idea to start a San Antonio Cash Management group. They pooled their client lists, split it into thirds, and began to contact corporate Cash Managers across the city to invite to a meeting, hoping to find enough interest to begin a local chapter of the National Corporate Cash Management Association. There were several practitioners that immediately came on board, among them: Diane Burgess- Datapoint Corp, Zada True-Courage- Harte Hanks Communications, Tracey Sulak Bedwell- Santa Rosa Hospital, and Dawn Lothringer- HB Zachry. 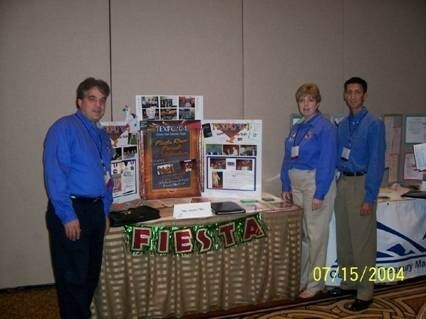 Forming the association was a slow start by a few individuals with no money, but great enthusiasm- organizing and reaching out to other colleagues with a goal: to provide San Antonio corporate Cash Managers educational opportunities and a network of professional contacts as a resource for cash management information. TEXPO…. In 1989, then-President Diane Burgess proposed that our association take on the Regional Conference, “TEXPO”, and crafted an agreement with the Houston association, who “owned” the event. The first San Antonio TEXPO was held that year during an economic downturn, making the experience even more daunting for a fledgling group that had little to no seed money and a very small membership. The group decided that the conference would be held during Fiesta, so that the hotel room commitment would be easier to drop if the attendees and the funds were not there to bring TEXPO ‘89 to completion. Happily, the event was a great success. Subsequently, in 1994, a state-wide Alliance of Texas Treasury Associations (ATTA) was formed with charter members Dawn Lothringer and Elaine Rustin –USAA (who also suggested the name) to rotate TEXPO between the major cities. TEXPO at Fiesta time in San Antonio has remained a popular choice for conference attendees. The name…. Starting as SACMA (San Antonio Cash Management Association), the group’s name has evolved to reflect the changes in the industry and membership. The named was changed to SATMA (San Antonio Treasury Management Association) in 1992, signaling a broadening and increasing responsibilities in Treasury. The current name San Antonio Association for Financial Professionals (SA-AFP) was adopted in 2014 to align more closely with the National Association. A cowboy boot with a dollar sign engraved on the side was the original logo for the association and adorned many documents, flyers, and TEXPO brochures until it was retired in 2014. Although many regional organizations did not and still don’t allow bankers to join, San Antonio has always been supportive and inclusive of our bankers- several have served as President. Without their support, the association wouldn’t be where it is today. The very first CCM exam for Certified Cash Manager, which pre-dated the CTP credential, was given in 1987, and SACMA sponsored a study group for its members. On the day of the national testing, which was given at a hotel on Austin Highway (no online tests back then), there was a monsoon of rain, and the streets were flooded- making it very difficult for those pioneer test-takers to get to the exam. The first monthly meetings were held afternoons downtown at the Joske’s department store at what is now Rivercenter Mall. Joske’s famous warm and scrumptious chocolate chip cookies were served, and are still remembered fondly by the original members. The initial communication between members (way before email and the Internet) was called the “Cash Letter” and was printed on green paper, so it was distinctive in the recipient’s mail. Legendary San Antonio Spur David Robinson was the keynote speaker at SA TEXPO 2004. Frank Abagnale, legendary counterfeiter and now security consultant, and of “Catch Me if You Can” fame, spoke at one of the Association meetings before he became a household name. We had to wait until he could make speeches in Texas, because he was still “wanted” in the state at the time.